Isn’t it amazing just how much that hyperquilting can add?! I know you don’t have much sense of a frame yet, but check back later this week for Part 2 of creating a feathered frame…! I used my phone camera and the pictures came out kind of blurry. I rushed to take closeups of each wreath and even though they looked good to me at the time, they’re even blurrier than the above photo, so they’re not really post-able. Every wreath came out great, though, and some of the students had never embroidered before in their lives! Way to go, you guys, and thanks for a fun class! 1. I can’t bear the thought of shoving that heavy quilt across my machine bed. Truly, there would be no joy in it for me, so what’s the point? 2. I am literally buried under all kinds of work I need to complete. Some of it is quilting, some of it is my medical job, and some of it is boring computer work that just needs to get done. I already have 5-6 quilts in varying stages of being quilted and it would be a good year before I could touch this one. I say that because there are many quilts in my head that haven’t been started yet and I would begin quilting those before I’d get to this one, simply because of not wanting to do it! 3. I can learn a lot of stuff by having this quilted by a professional quilter. That may sound odd, but it’s very, very true! 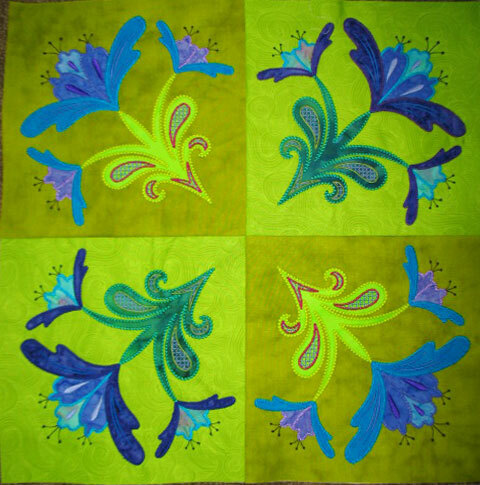 Each of us brings our own “style” and “eye” to quilting and it’s good to get a different perspective on design. 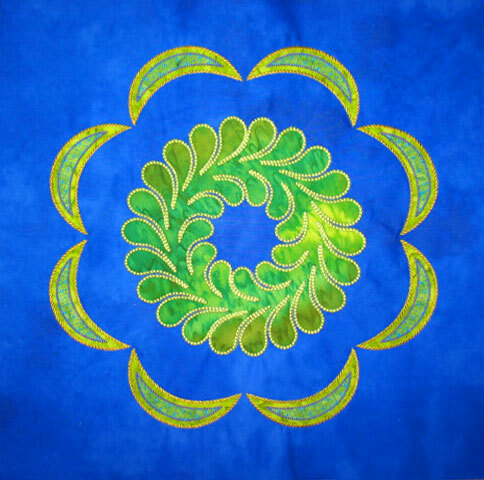 I absolutely LOVE Jenny Pedigo’s work (scroll backwards on her blog and oogle over the eye candy that her quilting is), and you’ll see what I mean. She has an incredible talent for dividing up blank space and creating something novel to quilt in that blank space. I am really curious to see what she creates. Does a part of me feel kind of badly that I’m not 100% responsible for finishing this quilt? YES, no question about it! BUT, I need to get this quilt done and off my list so I can move on to the next thing and the relief of having it completed far outweighs the negative feelings. I’ll never be able to enter it in a competition but that’s fine with me. I’ll be the proud owner of a beautiful quilt that I designed, embroidered, and pieced and that’s good enough for me for this quilt!